Kanchanaburi is a city in western Thailand that experiences regular warm temperatures. With a monsoon season that runs from May to October, it is one of the perfect locations for people to take a winter holiday to get out of the cold and snow of their home climate. Famous for its bridge over the river Kwai, some of the components seen on the bridge in Kanchanaburi are from Japanese war reparations. With plenty of unique historical locations to visit, Kanchanaburi is one of Thailand’s hidden treasures. The river side city of Kanchaburi which is just 2 hours drive from Bangkok offers plenty of natural spots with plenty of greenery. The most famous attractions of Kanchanaburi includes the Bridge over the River Kwai, a number of water falls, caves and temples. Here are some of the most popular tourist spots in Kanchanaburi. During the heart of World War II, Kanchanaburi was under Japanese control. They needed to have a railway constructed that would connect Bangkok with Burma. To create the railway, the Japanese used forced labor of Allied POWs and laborers collected from the region around Kanchanaburi. The conditions that the laborers faced were brutal and nearly half of them died from disease, accidents, and basic maltreatment. Though closed after the war, a small section of the railway, nicknamed the Death Railway over the river kwaae, has been opened for use since 1957. 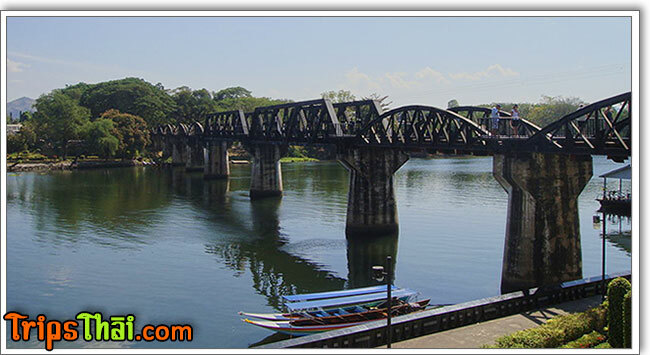 To commemorate the sacrifices of those who built this railway, Kanchanaburi is home to two museums and a memorial that tell the story of those who were forced to build the bridge and railway. A visit to these locations is well worth the effort! Some may know that Kanchanaburi is the home to one of today’s most influential Buddhist monks, but many know about the limestone caves that make up the temple of Wat Tham Phu Wa. There are several grottos sprinkled throughout the caves that track the different stages of life of Buddha. The access to these caves is easy through the Tiger Temple, which is in itself a unique place to visit as the monks routinely walk the 100+ tigers throughout the wooded areas of the land. There is also a Vipasanna meditation center available for those who wish to take some time to center themselves during their visit. Don’t Forget the Waterfalls of Sai Yok National Park! With a waterfall containing eight levels, Sai Yok National Park is a favorite place to escape the heat for a picnic or a swim. It can be busy, especially during the weekends, so plan your trip accordingly. Reservations are also highly recommended if you are planning on taking the train to the park. Paved hiking trails are available who wish to explore the park, while a bike lane is carved out of the trail as well so that everyone can enjoy their day away from the bustle of Kanchanaburi. If you love exploring the outdoors, Sai Yok National Park has what you’ll love! 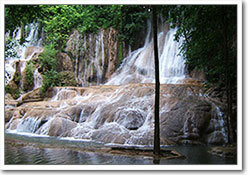 *Tip: Avoid going to Sai Yok waterfalls during long Thai holidays. It really gets crowded with locals and you will hardly find any space to enjoy. Are You Ready To Visit Kanchanaburi? With history, modern amenities, and plenty of outdoor adventure, Kanchanaburi is the perfect place to have your next holiday. Thailand may be famous for its beaches and islands. 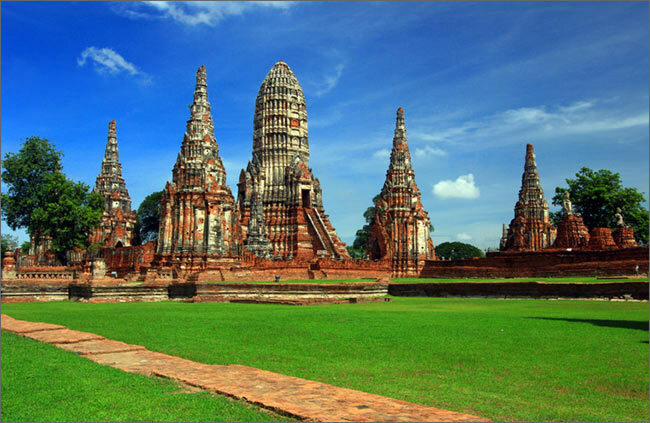 But there are plenty of other tourist destinations in Thailand like Kanchanaburi where Temples, gardens, and monuments are all waiting to be explored, and if you wish, you can also explore the final frontier of your own soul. Book your trip to Kanchanaburi and experience this community for yourself! Julie is a Thai girl passionate about her country, Thailand. She did her graduate degree in Tourism and hotel management and is working with a five star hotel in the land of smile. During her free time, she loves to share the exciting places she visited and guide you with useful travel tips. No, not really. Nam Tok is just a very small town not a trttnporsaaion hub. Best to go back to Kanchanaburi and check with a travel agent what may be available to get you to a major city on the route to Chiang Mai where you can caught a bus or train. . But the best yet is just go back to Bangkok and caught a bus or train to Chiang Mai. another thing to keep in mind that buses from Kanchanaburi go to the Southern Bus Terminal not Mor chit. I guess answering questions as 2 am disorts the mind.